Paul van Dyk recently revealed the first details of the second coming of We Are One, his Berlin-based festival. On July 6 the Renaissance-era surroundings of the city’s famed Zitadelle Spandau will swell to the sound of the very best in new, cutting-edge electronic music. Joined by a star-studded EDM co-producer cast, Van Dyk will re-purpose Spandau as a citadel of sound. Inside its 15th century confines he will premiere the music from his forthcoming ‘Politics of Dancing 3’ album. 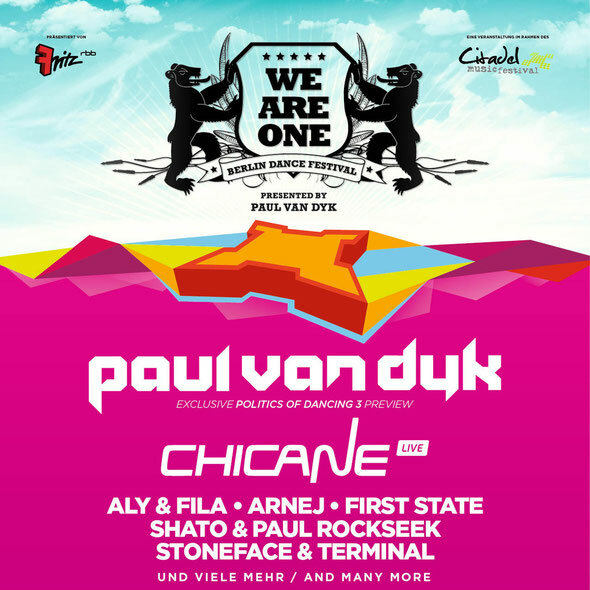 In 2010, as part of the celebrations to mark the 20th anniversary of the fall of the Berlin Wall, Paul van Dyk staged the We Are One event. It featured artists as musically and stylistically diverse as Armin van Buuren and Underworld, through to avant-garde performers like the Las Vegas-celebrated Blueman Group. Three years on, Paul has set in motion a return for We Are One. Moving from arena to festival grade, 2013 will see the event take place in the striking, history-rich setting of Berlin’s Zitadelle Spandau. Inside its ancient bastion walls, Paul will play his first Berlin-stationed, outdoor, open-air event since Love Parade. Some nine months after their launch, Nick Bracegirdle’s ensemble outfit, Chicane Live, will be taking to the We Are One stage with a live performance that will include the debut of Paul & Chicane’s first studio recording together. The night’s line-up will also include Saharan-hot sounds of Aly & Fila, who will bring their Egyptrance sound to the Zitadelle. Also taking to the stage will be new Vandit signings, SHato & Paul Rockseek, Holland’s First State, and German duo Stoneface & Terminal. 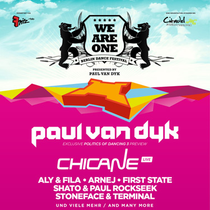 The We Are One 2013 anthem will come courtesy of PvD and Canadian tough-trance powerhouse Arnej, who’ll also be playing the show, alongside many more, yet-to-be-announced artists and acts.